Hello Folks! I'm Sheri Burns. 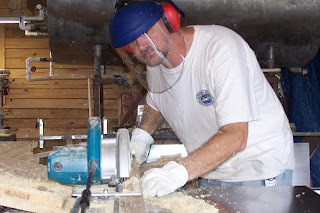 David and I are happy to share a little bit about our beekeeping business with you. David asked me to share some things today about selling honey and what I enjoy about our bee business. I work in the bee yard on occasion, when I'm needed. While the bees did bother me some in the beginning, I quickly got used to them and are not bothered by them at all now. I have never gotten stung by the bees while working with them, but have asked David to sting me at times to help with some occasional joint pain. After the first sting or two, you get used to it! I have learned not to fling my arms around them and never wear perfume or hairspray while working with them. Gentle, purposeful movements are key to working with the bees but no matter how careful you are, you may get stung. Just part of the business! Regarding selling honey, you have to develop a clientele. There are many ways to develop a clientele, such as posters in area stores, ads in your newspapers, etc. Tell the groups you participate in (community groups, school groups, committees, etc.) that you have honey to sell. Email all your friends about your honey and have them pass it on! We, of course, always have a booth at area festivals and in addition to the honey we sell, we make sure we have magnets for people to put on their refrigerator so they can remember where they got that good honey! We also have small displays we put in some area stores, and most work places allow you to do the same as well. You can also try calling your local newspaper and seeing if they would like to do a newspaper article on your business or farming venture. This will generate a lot of interest. Another idea is to let scout troops or classes come out for an educational project and make sure you send home literature with them for their folks! If you have teaching abilities, you may wish to consider putting on some "beekeeping" workshops and generate some business at the same time. And of course don't forget to put out a big sign in your yard to advertise so people can stop in and buy! Mostly we sell our honey from our bee farm, but we do have some displays in area stores. You can also have booths at local fairs. By reading your newspapers, generally you will find articles announcing area events with vendor information. After you are at a festival or fair the first year, the organizing group will typically automatically send you information the following year for vending at their activity again. It is important to have good presentation by attractively bottling your honey. Bottles can be purchased from any major beekeeping supply house. However, you must take into consideration the price, as well as shipping costs. In addition, many companies will not ship glassware to you but if they do, you will typically take that at your own risk (so in other words, if it breaks the company will not replace it). Plastic can be pricey, especially with the lids so a better idea may be to go with glass canning jars you can buy at your local hardware or Big Lots stores. You can get pint and quart jars which hold 1.5lb and 3lb respectively for sometimes half the cost of the jars you buy in the catalogs and you don't have to pay any shipping! Most customers seem to really like the canning jar look as well. Labels can be bought from the local beekeeping companies. Make sure the labels will fit the jars you have purchased. And they should say "American Honey" or "made in the USA". You can also tell the company what you want printed on the label, such as the name of your company, your family name, address, phone and website (if applicable). Some companies now provide the ability to purchase a blank back label where you can add information on your business and some personable information about your operation. Labels usually run around ten cents each. Other products can be made from the hive, such as beeswax and propolis by products. These other products can help to sell your honey as well and are good for customers who may not like honey but would enjoy a different honey product. Research how to make soap --it can be far too pricey to buy the materials to make decorative soap from the hobby store. But making the old fashioned lye soap can be pretty tricky, if not even dangerous thing to do if you don't know how to do it. Better yet, take a class on soap making. Watch your local newspaper or call your local museums and you can find someone teaching a class. Soap made with beeswax can help your honey sales too. You should also read up and research candle making. There are many good books easily available at the library. 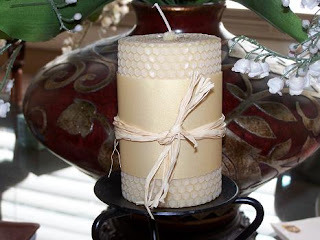 You can make candles from either the wax foundation sheets (candles are then called "rolled") or you can melt beeswax to pour into a mold or glass votive for solid "pillar" candles. These projects can be easy and fun to do, but be careful! Hot beeswax can be tricky to handle. Being part of a family bee business is interesting. It can be very rewarding having your own family business. We homeschool our children, and so our family is home together all day. We can enjoy the time together and also the ability to take off and do whatever else we want to do because we do own our own business. Watching the children learn new skills is a pleasure and I especially enjoy having my husband around during the day! See you at the next lesson and remember...BEE-HAVE yourself! Are there any legal issues one should be aware of when selling honey? Do you have to have any type of license to sell food or do you have to process the honey in a certain way, have quality and health inspections of your facility, etc? Yes, I have a similar question about bottling honey. Is the process similar to canning food in that you need to sterilize the jars and somehow seal the lids? However, if you do not heat your honey, how do you seal the lids?